On Oct. 14, 2001, a 24-year-old quarterback making his third NFL start was struggling. His team was 1-3 and had just lost the lead to the visiting San Diego Chargers, a sorry squad of rookies and rejects that had finished a woeful 1-15 the previous season. After misfiring on nine of his first 15 pass attempts, it was clear to many that the University of Michigan grad had reached a make-it-or-break-it point in his career. He had failed to throw a touchdown pass in either of his first two starts and entered the Chargers game with a lowly 67.9 quarterback rating. By way of comparison, Tim Tebow — a guy all the experts say can’t hit the side of a barn with a grenade, much less a football — recorded a 93.4 QB rating in his first couple of games as a starter. But our valiant hero refused to go down without a fight. He completed 27 of his last 39 tosses for 301 yards and led his team to an overtime victory, despite trailing by 10 points with 3:39 left to play in the fourth quarter. If you haven’t already guessed, that quarterback’s name is Tom Brady and, since that monumental come-from-behind victory, the New England Patriots’ superstar has accumulated a record of 136-40 as a starter, including two Super Bowl wins. Sadly, jockey Chantal Sutherland is no Tom Brady. Riding Game On Dude, one of the pre-race favorites and a horse that had given Sutherland perhaps her biggest career victory in the 2011 Santa Anita Handicap, the 36-year-old Canadian rider did the inexplicable. Instead of establishing a forward position in the early going — Game On Dude has been first or second at the first call in 12 of his 13 races for trainer Bob Baffert — Sutherland allowed the five-year-old gelding to saunter out of the gate, taking him out of his game and forcing the son of BC Classic winner Awesome Again to go extremely wide on the turn for home. 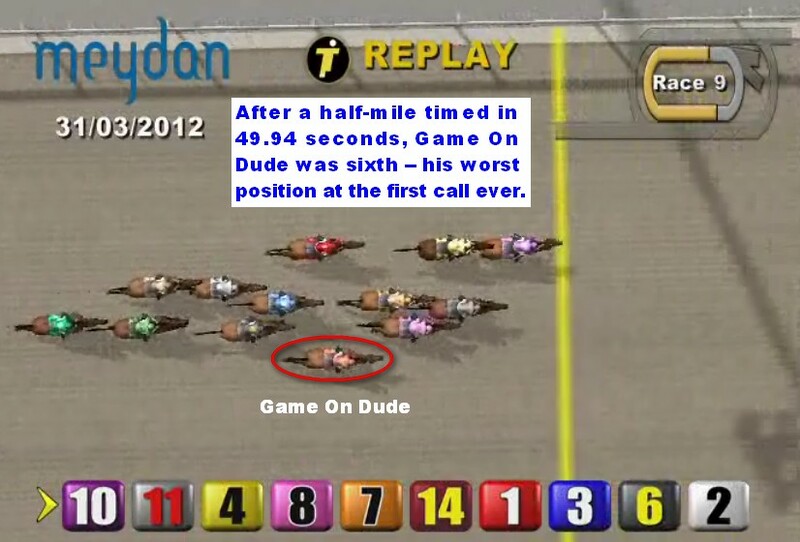 The first quarter of the $10 million World Cup was run in 25.72 seconds and Game On Dude was three lengths behind the leader, Transcend. 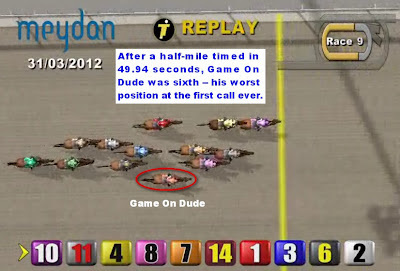 Even allowing for the fact that the timer starts when the gates are sprung at Meydan Racecourse (most tracks have a run-up distance before the clock starts ticking), 25.72 seconds is slow... like cast-of-the -“Jersey Shore” slow. Hence, there was absolutely no excuse for Sutherland to be in the position she was. And her passivity put her and her mount squarely behind the 8-ball when Transcend — quite predictably, I might add — accelerated over the next two furlongs while carving out a :49.94 opening half-mile (+3 early speed ration). Whether she’ll retain the mount on Game On Dude remains to be seen, but one thing seems abundantly clear: Sutherland is not yet ready for the big time. ALPHA and GEMOLOGIST figure to vie for favoritism, but based on what I’ve seen from STREET LIFE so far, he’s the horse to beat. After coming from the clouds to break his maiden on Feb. 11, the son of Kentucky Derby winner Street Sense made his next start in the $75,000 Broad Brush Stakes and, again, closed like his papa to win going away — earning a 95 Brisnet speed figure (the Wood par is 107) and 0 late speed ration (LSR) in the process. A number of horses could win this event, but two in particular intrigue me: OUR ENTOURAGE and MORGAN’S GUERRILLA. The latter improved both his ESR and LSR last time and appears to have enough early zip to dictate the pace in a race known to be kind to frontrunners. The former switches back to the main track after a scintillating win (95 Brisnet speed figure, +3 LSR) on the green. Obviously CREATIVE CAUSE is the one to beat, but I’m intrigued by LONGVIEW DRIVE, who I think has a lot of talent and could rebound from a very dull effort in the weaker division of the Southwest Stakes. Live racing is scheduled to return to Keeneland Racecourse on Friday, April 6, so I decided to scour that track’s outstanding PolyCapping Database in search of some betting gold nuggets. * Favorites that last worked out over the Keeneland strip have won 72, or 44.4 percent, of the 162 maiden special weight (MSW) sprint races (less than a mile) carded since 2006 — good for an ROI of 22.59 percent. 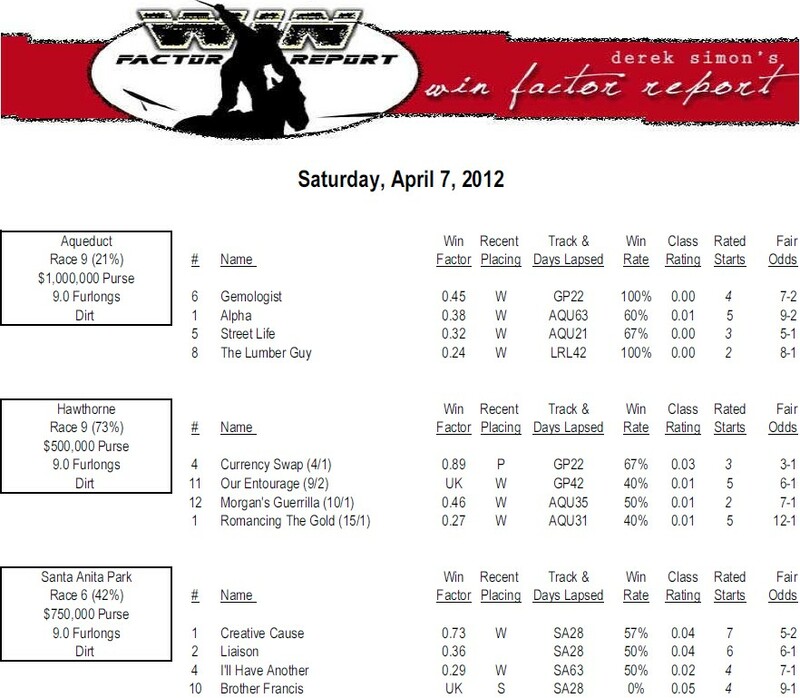 * It might be wise to avoid favorites in stakes races. Since 2006, they have won just 25.1 percent of the time and produced a -33.27 percent ROI. Stakes favorites switching from the grass to Keeneland’s Polytrack are an even worse bet: just 19.4 percent wins and a -55.65 percent ROI. * Favorites in claiming races that last raced on dirt and have not had a subsequent workout over the Keeneland surface are 14 of 64 since 2006, with a -38.59 percent ROI. 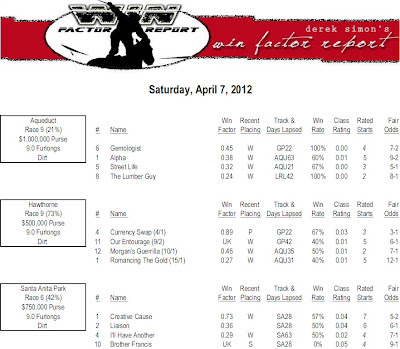 * Since 2006, $2 exacta payoffs have averaged $121.81, $2 trifectas $984.59 and $2 superfectas $5,629.24.